In his original plans for St Paul’s Burwood, the architect Edmund Blacket designed a tower for six bells. However, it was not until 1924 that the tower was completed. The Rector R.A. O’Brien was responsible for the fundraising and obtaining the ring of eight bells that were cast by John Taylor & Co bell founders of Loughborough, England. The bells were installed and dedicated on the 3rd April 1960. Each bell has an inscription of the donor and a passage from the Benedicite. The bells are in the key of G. The largest bell, the tenor rings the lowest note and weighs 11cwt. The smallest bell, the treble rings the highest note and weighs 2cwt. A ringer is required for each bell, which is hung in such a manner as to ring full circle of 360 degrees with each stroke. The bells do not ring tunes but follow specific mathematical patterns (known as changes) that the bell ringer memorises. When ringing bells one of the aims is to ring a sequence that includes every possible change. In the case of 4 bells such a sequence would be 1x2x3x4 = 24 changes and take about 50 seconds to ring. 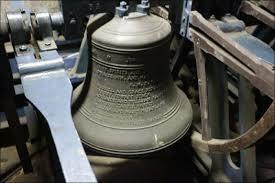 The maximum number of changes on 8 bells is 40,321 and would take at least 22 hours to complete. A full peal consists of 5,040 changes and takes approximately 3 hours. 50 peals have been rung at St Paul’s and these have been rung to celebrate weddings, baptisms and other important events. Bell ringing does not require great physical strength, nor do you need knowledge of music or mathematics. It relies on memory, co-ordination, and sense of timing, rhythm, concentration and an ability to work as a team. Ringers come from all walks of life and age’s range from 12 – 90. St Paul’s has 12 regular members who ring every Sunday for the 9.30am service, for weddings and other special occasions by arrangement. Bell ringing practice is held every Thursday night except in Holy Week. If you are interested in being involved in bell ringing or just want to see it in action please contact the Tower Captain, Pam Brock on (02) 9747 4327.